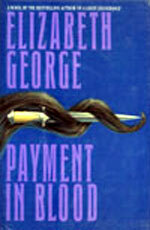 adapted as "Payment in Blood"
Synopsis: The career of playwright Joy Sinclair comes to a rather abrupt end on an isolated estate in the Scottish Highlands when someone drives an eighteen-inch dirk through her neck. Called upon to investigate the case in a country with virtually no authority, the aristocratic Detective Inspector Thomas Lynley and his partner, Detective Sergeant Barbara Havers, grapple for both a motive and a murderer. Emotions run deep for the list of suspects soon includes Britain's foremost actress, its most successful theatrical producer, and the woman Lynley loves. He and Havers must tread carefully over the complicated terrain of human relationships, while they work to solve a case rooted in the darkest corners of the past and the unexplored regions of the human heart. This DVD set includes Well-Schooled in Murder, Payment in Blood, For the Sake of Elena, and Missing Joseph. 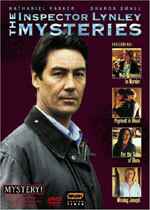 See also Telemystery: Inspector Lynley Mysteries for a complete list of made-for-television movies based on these series characters.